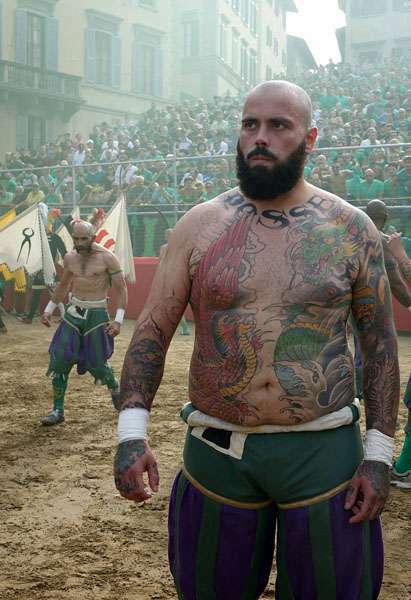 With the FIFA World Cup fast approaching it feels like everybody is indulging in the beautiful game, even if that does involve strapping tattooed men of Florence in this fiercely violent 'alternative' to football, Calcio Storico. 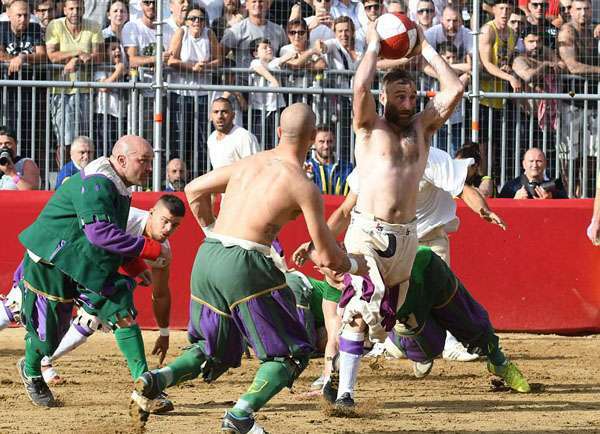 The sport, played out annually in the Italian city's Santa Croce square, takes the 'beautiful' out of the game and smashes just about everything in between the popular phrase. This is an all-out slug-fest that sees opponents challenged to knock seven bells out of one another, as well as score some points, with nothing more than glory on offer as the prize. The annual tournament is made up of four teams comprising neighbourhoods Santa Croce (blue), Santa Maria Novella (red), Santo Spirito (white), and San Giovanni (green). Matches between two sides of 27 players take place over a gruelling break-free 50 minutes and no substitutions are allowed even if there are injuries — and there are plenty of those. 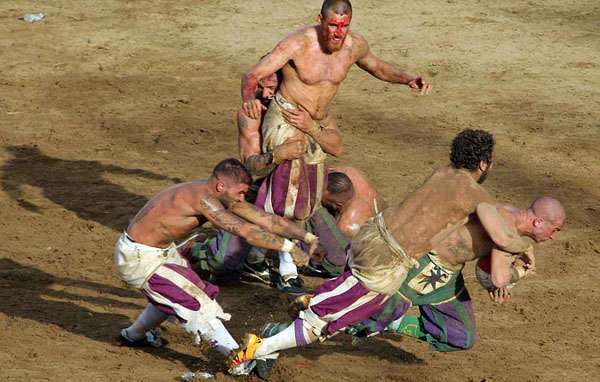 It was too brutal for some, most famously King Henry III of France who watched the 1573 Calcio Storico only to remark 'too small to be a war and too cruel to be a game'. 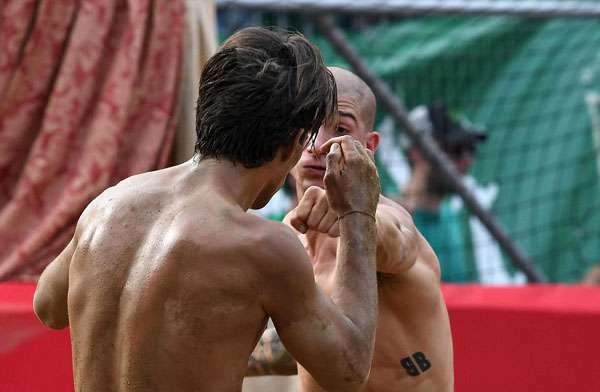 The game is played on sand in an area roughly the size of a modern day football pitch and combines elements of rugby and wrestling. Teams scrap to keep possession of the ball and kick it over the fence at the opponent's end of the field. 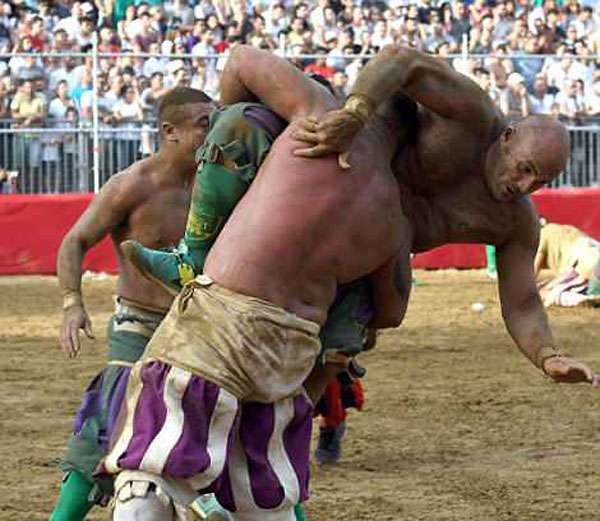 Surprisingly there is a version of some adapted rules to help keep injuries to a minimum, including no one player being able to fight a single opponent at once, but judging by these photos that doesn't seem to be the case. A lot of fighting techniques are allowed, including martial arts. There is a referee with six linesmen who attempt to keep the peace. But at any one time they have dozens of fights to deal with and players have been known to get knocked out before they can be reached. 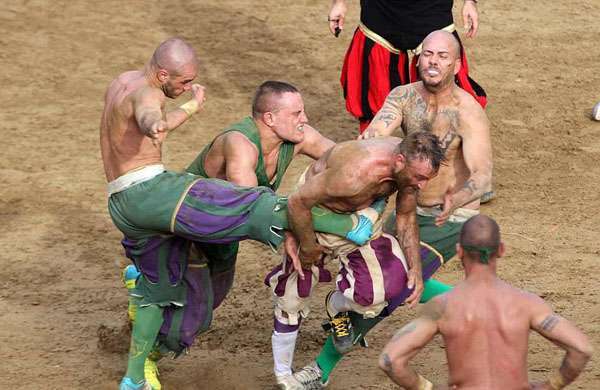 The exact history of the Calcio is unknown, although a sport similar to the one played each June in Florence was popular with soldiers of the Roman Army before the city of Florence was even founded in 59AD. 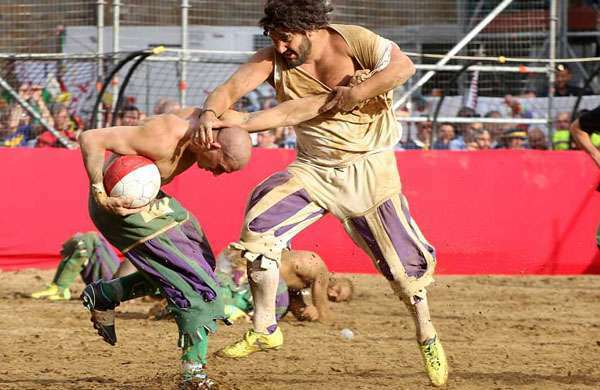 While it was likely played in Florence throughout the 15th Century, the first recorded game took place in 1530 as Florentines played a match in Piazza Santa Croce despite the city being under siege by French troops. 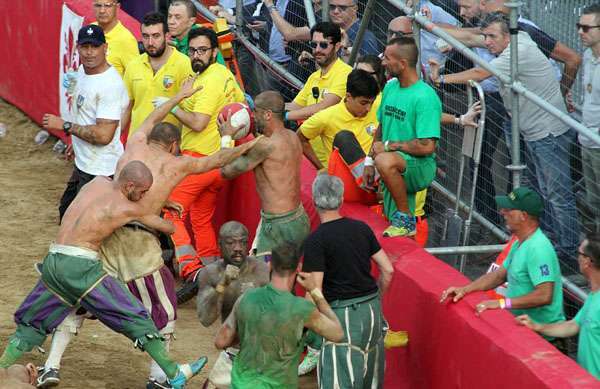 Calcio is seriously dangerous although no deaths have been recorded in modern times. The match was banned for a year in 2007 however after a brawl involving 50 players were taken to court. Proof that we are animals.